How to get points coordinate position in the face landmark detection program of dlib? This program detect the face feature and denote the landmarks with dots and lines in original photo. I wonder if it is possible to obtain each points' coordinate position. Like a(10, 25). 'a' denotes corner of the mouth. After slightly modifying the program to process one picture at one time, I try to print out the value of dets and shape without success. # Get the landmarks/parts for the face in box d.
# Draw the face landmarks on the screen. Today, I remember the help() method in python and have a trial with it. as the corners of the mouth and eyes, tip of the nose, and so forth. In the original code, variable shape is the output of predictor method. with the positions of each of its constituent parts. |      The number of parts of the object. |      The bounding box of the parts. It seems that variable shape is related with points coordinate position. I assume that there are 68 denoted face landmark points. If it is true. The remained problem is that which part is responding to which face landmark point. 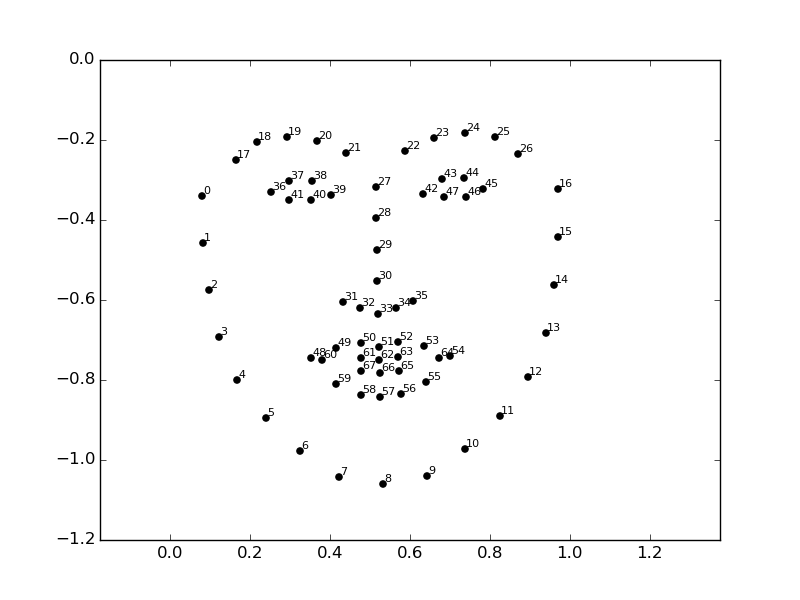 And there is another open source project OpenFace, which is based on dlib and describes each point's correlating part in face. Not the answer you're looking for? Browse other questions tagged feature-detection dlib or ask your own question. Dlib. How solve the optimization constraints to be on real time ? Idea of landmarks convergence?